Swedish film and theatre director Ingmar Bergman’s hugely iconic and sustained 1957 meditation on the inevitability of death and suffering in the Middle Ages makes a more than welcome return to the big screen, courtesy of this lovely new print. The Seventh Seal was expanded from his one-act play, The Wood Painting, which he wrote years earlier as a way of teaching his acting class at Malmö Theatre about the holy divinity of ensemble acting. It took its lead from the rigid, terror-stricken imagery of 14th century Lutheran church murals and the fatalistic, mystical and symbolic style of Belgian poet, playwright and essayist Maurice Maeterlinck (The Blind, The Blue Bird) who Bergman admired deeply. Returning crusader knight Antonius Block (Max von Sydow), accompanied by his squire Jöns (Gunnar Björnstrand), seeks answers about life, death and the existence of God as he crosses his homeland, which has become racked by the black plague, superstition and fundamentalist Christianity. Pursued by the Grim Reaper, who he tries to keep at bay by playing a continuous game of chess, Block befriends a troupe of strolling players and a woodcutter. But it soon becomes clear that Death has designs on more than just the knight. But who will survive the reaper’s scythe? 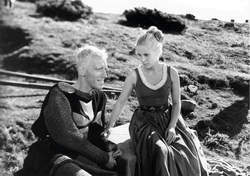 Though by no means perfect and, for a modern audience, perhaps a little slow and portentous, The Seventh Seal still has the ability to leave one full of awe for its mix of naturalism, theatricality, unforgettable images and many remarkable set pieces (nearly all of which contain some kind of corporeal mortification). By his own admittance, this is the work of a man still grappling with ideas of faith, God’s cruelty and the sheer brutality of the human race. Filmhouse, Edinburgh from Fri 27 Jul. Bergman's hugely iconic and sustained meditation on the inevitability of death and suffering in the Middle Ages makes a more than welcome return to the big screen courtesy of this lovely new print.